A sample of the features of foreCASH are shown in the following screen shots. foreCASH gives a Daily and Weekly level of detail on cash flow for key customers, suppliers and cost categories. A month end view of cash shows just 3% of the days in the year. A daily view is needed to avoid shocks and give time to plan stock levels, temporary loans, payment deferrals or sales and collections incentives. 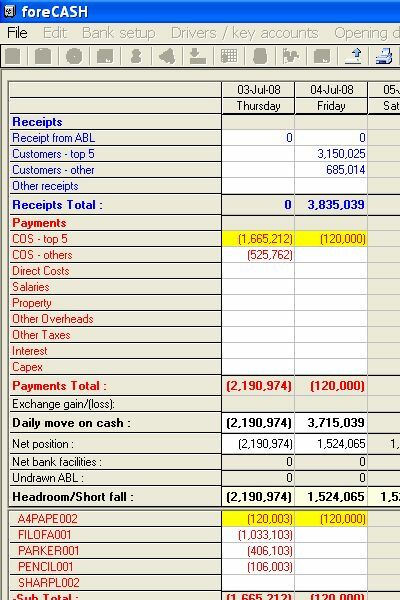 Monthly reports for Profit and Loss, Balance sheet, Cash Flow and Funds flow are given. foreCASH can produce forecasts looking up to twenty-four months into the future. Or you can forecast for just four months in order to monitor cash in the next 100 days. Actual data can be combined with your forecast to show Profit and Loss for your whole financial year. All monthly and weekly reports can be exported to Excel. 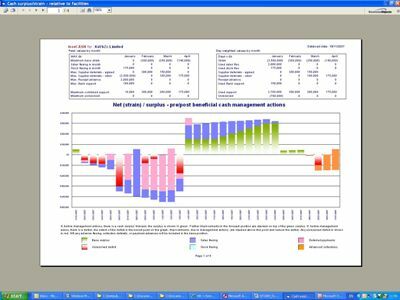 Image shown: Profit and loss Excel report with detail drill down. 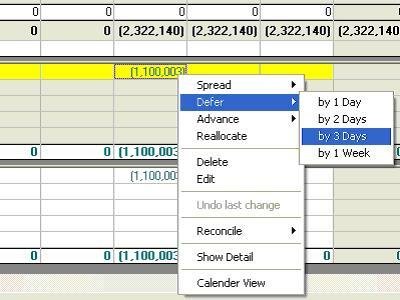 If you want to defer a payment to manage your cash flow you can achieve this very quickly from a 'right-click' menu. Because the process is automated it is quick, and it avoids the risk of introducing errors through the manual entry of data. In a similar manner, a payment could be advanced, or spread over a number of days. Payments can also be re-scheduled by simply dragging and dropping them with the mouse onto the desired day. 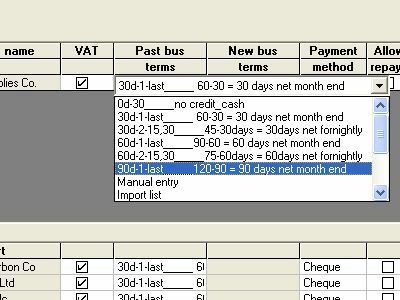 For ultimate flexibility you can also re-allocate payments using a 'calendar' view. Having made a change you can add a note to record why the change was made and set the status of the change. 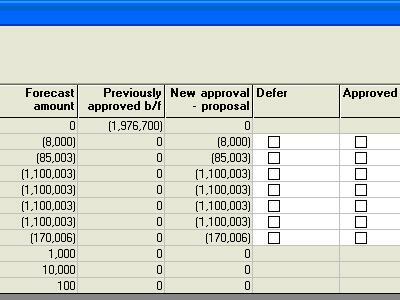 You can run a report based on the status of changes to show where you still have tasks to arrange - such as agreeing deferrals with suppliers, or agreeing early payment discounts with customers to boost collections. In addition to numerical grids foreCASH allows you to analyse and interpret your forecast with the help of graphical reports. The summary graph shown below shows where management actions are being used to resolve cash strain (red moves through amber to green) or where strain (solid red) remains unresolved (red stripes). In order to maximise the accuracy of your forecast there is a large selection of terms of business that can be allocated by customer and supplier. In addition to the pre-loaded options users can request two bespoke complimentary* rules. Users can also select a profile which reflects the activity levels of their business if, for example, their sales are weighted towards the start or end of a month. Other advanced options include modelling supplier and customer rebates and automatic allocation of opening credit note accruals. Should sales or stock levels start to deviate from your budget, or should you wish to see the cash impact of changing sales or stock strategy, foreCASH offers you the choice of flexing both sales and stock. 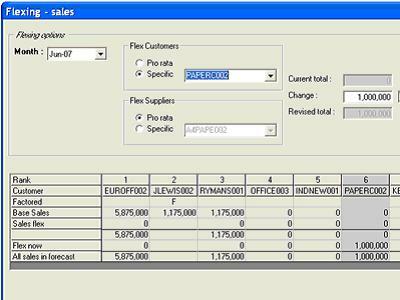 Sales flexes can be applied to the top 9 customer and supplier accounts individually, or against all accounts on a pro-rata basis. Deviation, to a greater or lesser extent, from a forecast is inevitable and so foreCASH's reconciliation process ensures that any skew is easily re-aligned. If a payment differed from the forecast amount any adjustment can quickly be offset/added to a later date. Again the automation of this process means the risk of typographical errors is removed. 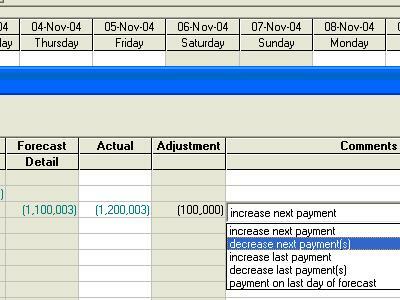 Another method of ensuring a tight delivery of your cash forecast is through the 'Payment Release Control' sheet. This control/report allows payment runs to be carried out based on items authorised within the cash forecast. Payments forecast to clear in the next 10 days are displayed, and where not previously approved, can be approved for payment, deferred or a decision postponed. Any deferrals are immediately fed back into the forecast. Managing cash flow can be a thankless task for an FD. If you warn of problems and Armageddon fails to materialise you can be accused of over-reacting. Because foreCASH records the original underlying cash forecast you can easily demonstrate the steps that were taken to hit a cash target or to avoid breaching borrowing facilities.